Macroeconomic surprise indices have become increasingly popular in recent years. To many investors they matter more than the actual macro-economic numbers, which should make macro surprise indices a useful tool for forecasting the direction of financial markets. But, while I do agree with the former, the latter isn’t necessarily true. The degree to which a freshly published macroeconomic number beats expectations is often more valuable to investors than the number itself. For example, the abundance of GDP growth forecasts has already been fully absorbed by the markets by the time the number finally gets published (usually at least one month after the end of each quarter). Looking at the latest published GDP growth figures is a bit like looking in the rearview mirror. It’s the deviation from what was expected that makes investors reassess their view. The bigger the deviation, the more likely it will change. The notion that investor behavior is partly driven by macro surprises has led to the development of numerous macro surprise indices. Basically, all of these indices work the same. They ‘index’ the size of the surprise for a large set of macroeconomic variables relative to their own surprise history. The weight of macro variables is based on their (assumed) economic and market impact. For example, surprises on the outcome of the ISM Manufacturing Index and unemployment carry a bigger index weight than surprises related to vehicle sales and housing starts. 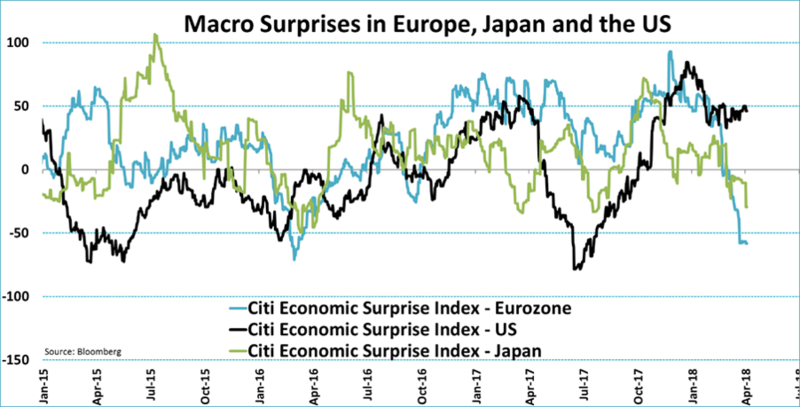 In most cases the macro surprise index has a value of zero when expectations are exactly in line with the actual numbers. It rises when numbers are beating expectations and vice versa. A macroeconomic surprise index is a useful tool to show if an economy is doing better or worse than anticipated. But how does it stack up as a market forecaster? 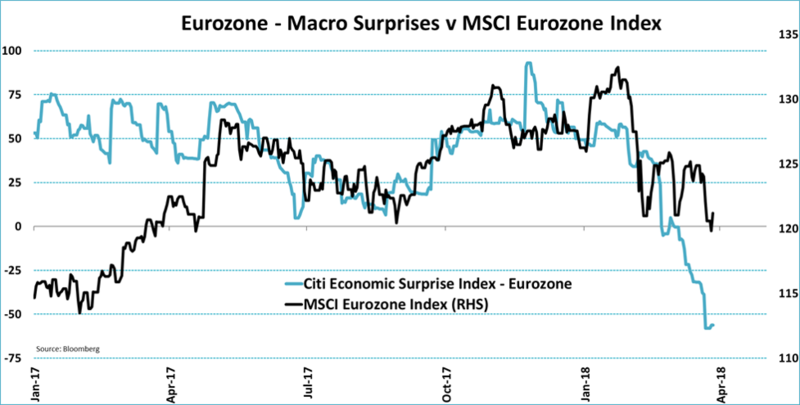 Let’s take a look at the chart below, which shows the Citi Economic Surprise Index for the Eurozone and the MSCI Eurozone Index since the start of last year. As we can see, the surprise index regularly tends to coincide with the direction of Stoxx 600 Index occasionally, but this is definitely not always the case. This observation holds for many other short-term investment periods as well. But when the investment horizon increases things look quite a bit different. The chart next chart shows the S&P 500 Index against the Citi Economic Surprise Index for the US since March 2009 (the low in equity markets after the outbreak of the financial crisis). The relation between macro surprises and stock markets is pretty much absent. Obviously, macro surprises are not the only factors that explain stock market returns. Valuation company earnings, and political risks are just a few others. But there are other more specific reasons for why the relationship breaks down as the investment horizon increases. 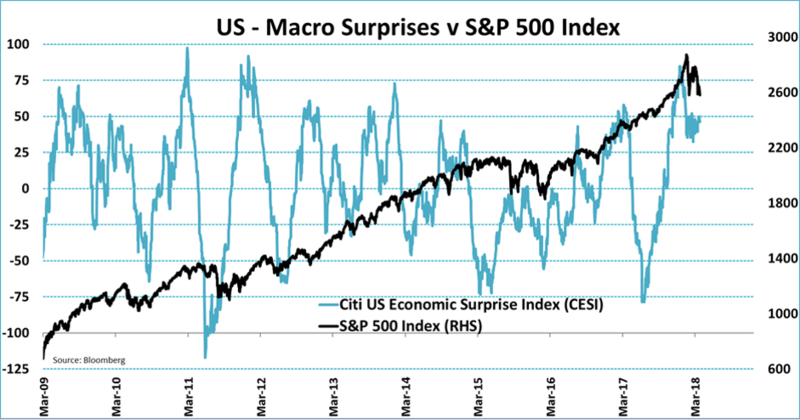 First, macroeconomic surprise indices are mean-reverting while equity markets are not. Macroeconomic expectations are not static. If more macro data surprises on the upside, economic forecasters will raise their forecasts. This, in turn, means that the bar for beating expectations is also raised. And when the economy is doing poorly, forecasters will lower their expectations, thus increasing the odds of better than expected future economic data. This results in a mean-reverting pattern in macro surprise indices as shown in the graph above. Second, the simple fact that these indices are about surprises, reduces their usefulness as a market predictor. By definition a surprise is not something you can anticipate. Surely, individual investors can have different views on the outcome of economic data, but surprise indices are about overall market expectations. This implies that, on average, they are not effective in predicting financial markets. That’s not to say, however, that their predictive power is zero. Historical data show that macro surprise indices have some forecasting power, but only at very extreme levels. In other words, when expectations about the economy are particularly gloomy or overly optimistic. Unfortunately, these extremes are pretty rare.